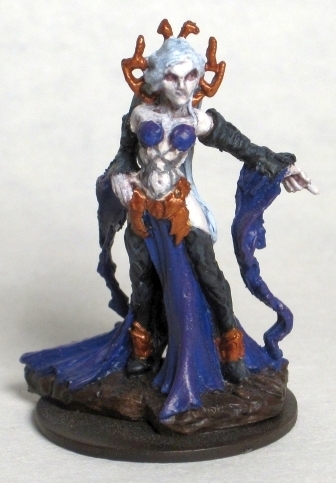 Is this week’s model a sorceress? A demon? A queen? A martial artist? I don’t know for sure, but I love how many different takes this week’s artists had on it. Nothing new on the crowd funding front to report. I would like to know how many of my readers backed the Bones 2 project. 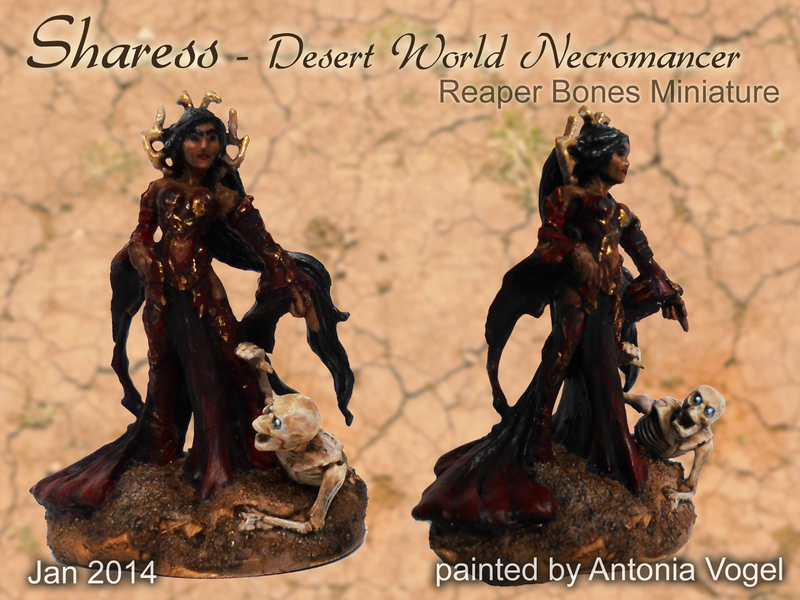 So many of the really exciting minis from bones 1 have been done. Maybe we should switch when they ship. Thoughts? I went for a royalish demon queen sort of vibe. I thought the copper came out well, and though the red undertones in the gown didn’t come through with the camera, it’s still blended well. As several painters mentioned in their emails – the detail on this one was particularly bad. Arjen chose to go with a drow, and tried out some new techniques. 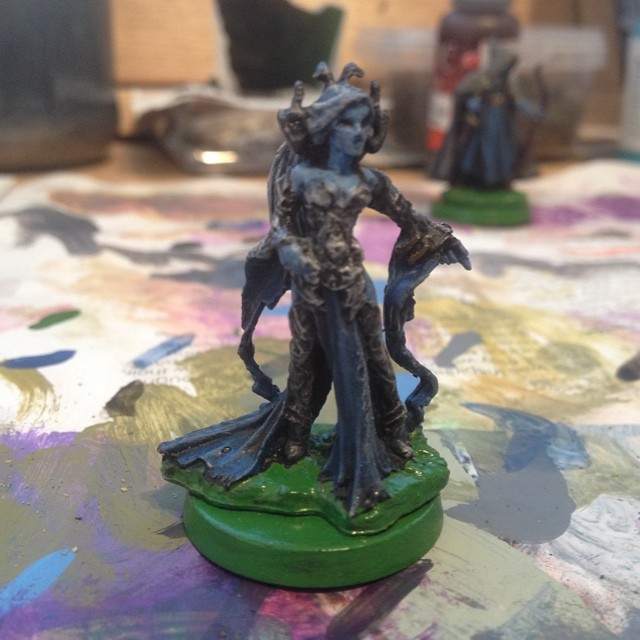 I think this mini came out very painterly. 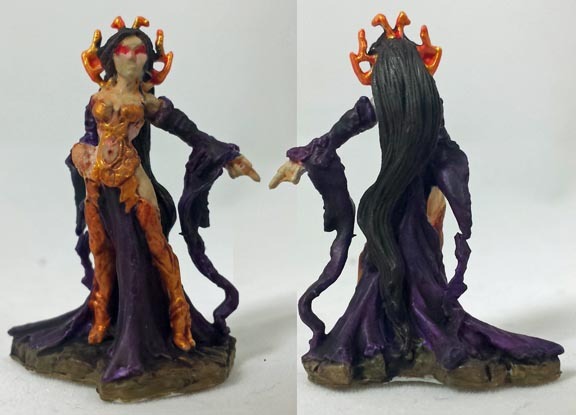 Antonia made a Darksun mini. I love the undead addition as bright contrast to an otherwise dark color scheme. Jo also went with a Drow theme. I really love how different the same miniature can be, even when two painters go in a similar direction, they end up in totally different places. Jessi went Wuxia, and made this modeal a martial artist. Anime eyes and painted on abs are the highlights on this particular model. Magnus sends in a late entry, painting it to match an earlier figure. Was that sneer intentional, or a quirk of the brush? I´m impressed by the variety of themes the participants took this time. 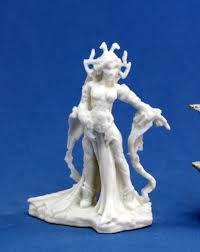 But that´s the fine thing on bones I think – you have minis for every opportunity or character concept. Even more with bones 2! My wife and me backed it and can´t wait for it to arrive. We took the base set twice and many of the expansions and bonuses… so we are well equipped to go on (and on… and on… 😉 ). David, good to see you painting again. Jessi seems to have done some sculpting and modifying, excellent. Jo brought out all the detail in the clothing (whereas I just threw some wash on when I was not satisfied). Antonia, …cannot really judge the sorceress as I am being mesmerized by those glowing skeleton eyes…must resist…AAH! And I have backed Bones 2 with add-ons. I did not take the Dragons don’t share thing because of shipping costs and cupboard space, but I will get both fantasy expansions and some other stuff. I vote monsters first. I also got the bones 2, with all the dragons, cause I’m a sucker. 🙂 I’m happy to paint whatever! Nice entries guys! i was a little daunted because I was having a hard time picking out the details on this one. I am impressed with all of the work you all pulled off. I’m looking forward to joining you again next week for the flesh golem. Hello everyone, great minis this week! I’m glad we have so many entries, it’s always interesting to see everyones approaches. If anybody is interested, here is some background info on how I came to paint this mini (I partially wrote this in my mail to David, but perhaps it gives some insight). The mini will be used as a necromancer in a D&D campaign, as David mentioned, so she needed a minion and some extra drama. 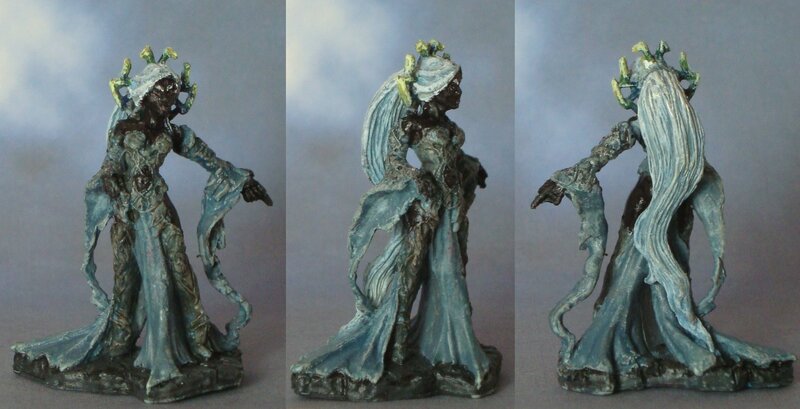 I used a skeleton by Mantic (they give some extra pieces on every sprue), changed her arm position a bit and made her flowing robes a tad longer (just for the dramatic effect and to work with the extra elevation of the base I needed fo the skeleton). I’m happy with the muted color scheme, since I always try to use a reduced spectrum of colors to avoid a too colorful look. The glowing of the skeleton’s eyes were quite easy to paint, I’m afraid :-p – I chose a pale blue base color, put a dark blue wash/ink over it and gave it a tiny white drybrush right on top of each eyeball, and that was it. Actually, although in Europe, I might even get my stuff before some of the Americans, as I am in wave three. So I guess we’ ll just have to check now and then how many already got their stuff. Meanwhile, there are still a lot of Bones we didn’t paint, so it is not like we are running out. I would love to. My concern is that not everyone has them though. I understand; the core sets are what almost all backers picked up, and even if someone didn’t it’s cheaper to pick up a few small figures for Monday Miniatures compared to a giant or dragon. I think pulling from the core sets of both Bones I and Bones II will give us plenty of variety! The question would be, when to start including Bones II figures? Since there are numerous waves, there’s no telling when everyone will get theirs.